The redevelopment of the Tallahassee Mall continues to gain momentum, while enterprising homebuyers are starting to stake their claims on homes within walking distance to the new Centre Of Tallahassee. 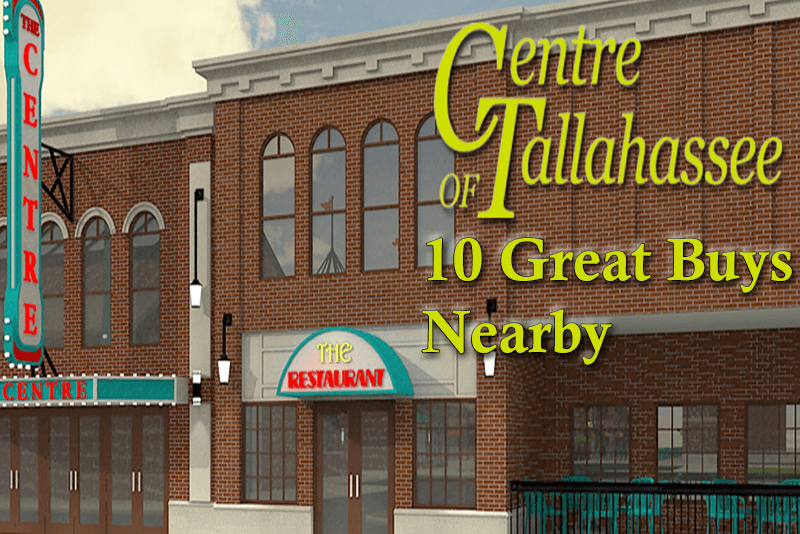 From old and tired to new and exciting, expect the Centre of Tallahassee to re-energize a part of town that had been depreciating for the past 20 years. The Tallahassee neighborhoods in this area will be next in line for their own redevelopment. Many of today's homebuyers are not even aware of the opportunities that surround the redevelopment, as they often just shuttle out away from town to suburbs that will require a daily commute. All across the United States, real estate agents are reporting a trend of people moving back into the city from out in the suburbs. People are seeking a life-style change that involves less time commuting and more time enjoying the company of friends and families. The developers of The Centre are likely expecting this trend to make its way here as well (and I believe they have correctly identified a huge opportunity in Tallahassee). I see young married couples and singles wanting the types of attractions that will be available in The Centre that are currently only rarely available near the Universities. An open-air shopping center with an urban park and concert venue, an ice-skating rink with local brewer (this could create an interesting combination), plus modern stores that are found in larger cities will certainly gain traction with the under-30 crowd in Tallahassee. But there are some incredible opportunities that can be found among the homes for sale within walking distance to the Centre of Tallahassee that will make today's buyers look like Nostradamus in the near future when The Centre is complete and drawing people who will want to live nearby. The Centre of Tallahassee is located at 2415 North Monroe Street, and everything within a mile of this location can be seen as "within walking distance." Of course, closer is better. Most of the homes within this ring around the Centre were built more than 50 years ago, so the prudent buyer will want to key in a small redevelopment of their own. Buy a home with a large piece of land (in this area, large means more than a quarter acre) and plenty of "under roof" house and you will likely be positioned to have a very-sound real estate investment. Some buyers will be shocked with how much home they can get for the dollar within walking distance of The Centre. In fact, the first home is on more than a half an acre, has five bedrooms, hardwood floors, and boasts nearly 3,000 square feet of home under roof. Out in the suburbs, this home will cost you $400,000 or more today. I think today's suburb prices will very soon be tomorrow's in-town prices as people move back towards downtown Tallahassee. Remember, just like all other markets, the real estate market is ruled by supply and demand. Homes near The Centre of Tallahassee have been in very low-demand over the past 20 years, as the suburbs rose and pulled people to new areas. This low-demand has driven down property values. But if you believe the renewal of "in-town" is likely (like what is occurring elsewhere in America), then you have to believe demand for homes near The Centre will rise. When demand goes up and supply is limited, prices must go up too. People who take advantage of the past trend and "buy low" today will be rewarded in the future when demand for living near the Centre of Tallahassee is high. While I believe the Centre of Tallahassee will be a large draw, it is by no means the only reason for the revival of home values that is returning to the area. If you have read any of my past Town N Country Park Real Estate Reports, then you already know that I have identified this section of Tallahassee as a hot up and coming area. In fact, years ago when this centrally located part of what is considered NW Tallahassee was at its worst, I forecasted that a change would occur. Well, the change has begun. It's all about the amenities. These homes are within walking distance of The Centre, sure. But they are also within walking distance of Lake Ella and Levy Park. They are less than 2 miles from the Capitol and Doak Campbell Stadium. There are scores of dining opportunities too, from fast food to buffet, cheap to expensive, there is something (to eat) for everybody. Homes in this area have (relatively speaking) huge chunks of land underneath them when compared to some of the new homes being built and sold for more than $300,000 in NE Tallahassee. You will also find mature landscaping, as dogwoods and azaleas and all other varieties of plants and trees have been in the ground for more than 60 years. You just won't find this outside of town where many of the homes were built in the recent 20 years. If you want a yard large enough for a pool, close enough to walk to key attractions, a large enough home to house five or more people, and you want to spend less than $300,000, you really need to consider this part of town. The cool thing is you will be one of the first to identify this opportunity, so you won't have to foot the bill! The prices you see today will not be available much longer. As the Centre of Tallahassee nears completion, the crowds will flock this way and drive up prices. We also have pocket listings from time to time (pocket listing means a home that is not actively listed for sale but we know the seller is getting ready to hit the market and would consider an offer at this time) and we can add you to the VIP list for those homes as well. Our VIP list is completely free and without any obligation. To be added to the VIP list and to get a list of homes within walking distance to the Centre of Tallahassee that are coming to the market please click HERE and enter your information. Be a visionary. Go out and look at the homes for sale within walking distance to the Centre of Tallahassee and get your own redevelopment project underway so that you can enjoy the in-town lifestyle that so many others are choosing today. If you are interested in knowing more about the best buys near the Centre of Tallahassee, just SEND ME YOUR QUESTIONS and we'll answer them right away. Is Your Home HGTV Ready (Should It Be)?